Happy New Year from Green Vehicles! The turn of the year is traditionally a time to take stock of where we’ve been and where we’re going, which seems to us like a darn good idea for individuals and companies alike. In 2010, we focused on designing the future of our company and products, while perhaps putting too little effort into updating our friends, fans, and allies. Let’s fix that! After all, these are exciting times for Green Vehicles, and we want to bring you up to speed. The “Great Recession” has had a profound effect on most of us and our businesses. Green Vehicles also had to weather the times and make prudent choices in order to grow, develop product, and ramp up production at pace commensurate with this challenging period. However, the overwhelming interest and support for the Triac has successfully brought us through, as did our team’s dedication to our mission. In 2010, our exciting news is that Green Vehicles was one of the few U.S. companies that did deliver EVs to our customers. The company was one of the few recipients of grant support for expansion by the state of California. We maxed out our initial production capacity, thanks to customer demand generated almost entirely from YouTube and our website, which might be a historical first for any vehicle maker. With vehicles on the road, we gathered feedback from the first batch of Triac experts (aka, our customers) and have been integrating that information into design improvements for the Triac2.0, shipping in 2011. Green Vehicles also moved into our 80,000 square-foot manufacturing facility in Salinas, California, securing enough space to meet our growth for several years. Recently, we announced our partnership with battery-supplier Leyden Energy, maker of high energy-density battery solutions perfect for light-weight automotive applications like the Triac. As our first California-made Triac2.0 clean commuter vehicles come off the line, you will learn about our customers with fun podcasts we will call “I drive a Triac, what about it? 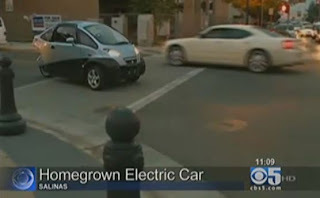 !” We expect the first customers who reserve a Triac will receive delivery of their vehicle by the end of 2011. 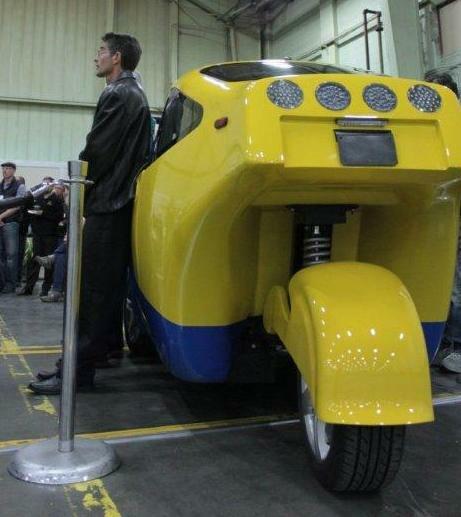 Thank you for your continued interest in Green Vehicles. Here’s to an exciting ride in 2011. San Jose Mercury News, "Triac ... getting ready to hit the streets"
The San Jose Mercury News Tech section for Monday, November 29, featured Green Vehicles and an interview with president Mike Ryan. Is there a Triac in your future? Maybe -- if your conscience has evolved to a deep shade of green and you have $25,000 to spare on a locally manufactured, three-wheeled gasless electric vehicle with a 100-mile range. ... It's no Tesla, but that's the point, Ryan says. The Triac is a less costly vehicle for an environmentally conscious lifestyle. OK, we don't have an exact count, but our guesstimate is 100 people came out in the cold and rain on Saturday, November 20 to participate in a reception at Green Vehicles' manufacturing facility in Salinas, CA. The reception was held to announce the partnership between Green Vehicles and our battery supplier, Leyden Energy of Fremont. We had a good showing from EV enthusiasts, Salinas residents, local politicians, and media. The size of the turn-out exceeded our expectations for a Saturday afternoon corporate event. What a testament to the excitement and expectations surrounding affordable, clean transportation options for freeway commuters. Many thanks to everyone who attended! KCBS San Francisco poses the question "Does it matter to you where your car is made?" 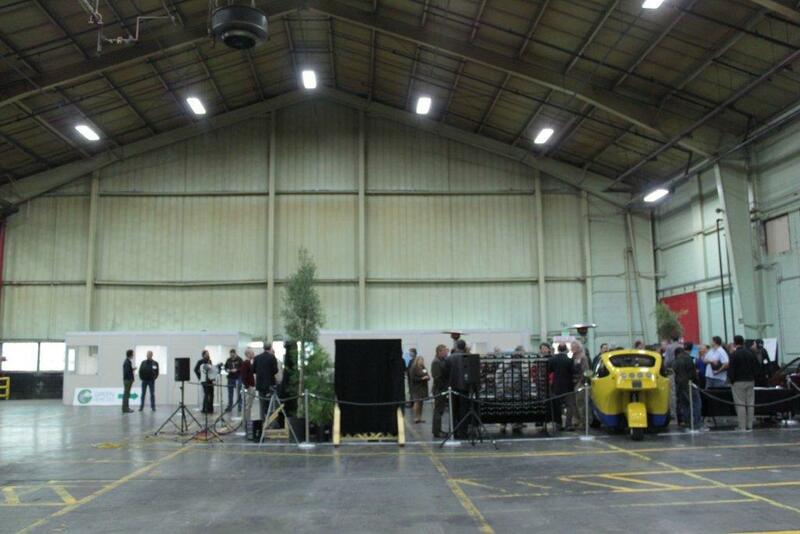 Roughly 100 people joined us at the reception in the Green Vehicles manufacturing facility. Here is the list of the labels we use to tag posts.